The CSIR Built Environment division claims that Alternate Building Technologies or ABTs, are not only faster to erect, they also offer “significant savings in energy and life-time costs of ownership”. In comparison, exposed brick and face brick schools are extremely low maintenance, reducing operating costs as well as downtime due to repairing, replastering and repainting of walls. 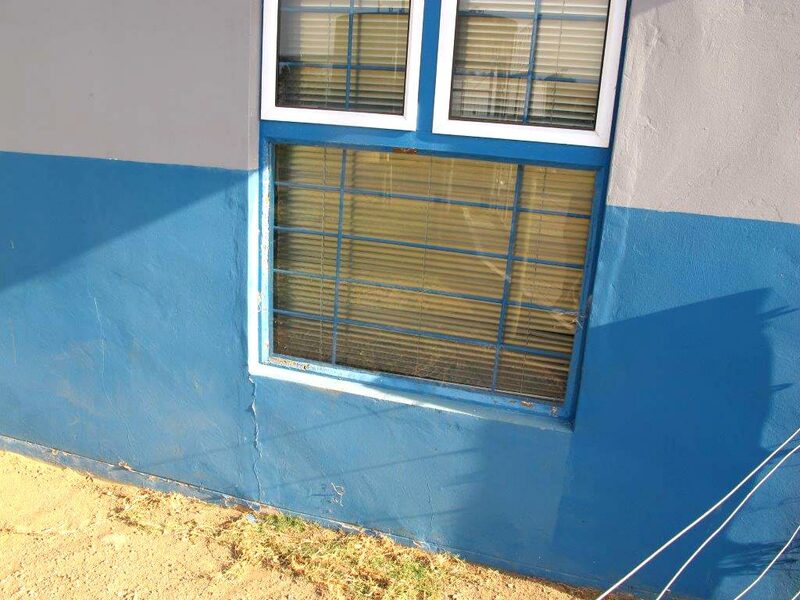 Olivenhoutbosch Primary School - The integrity of ABT external walling is visibly compromised. Joins between the panels are now exposed to the weather. Pakamani Senior Secondary School – Extensive horizontal and vertical cracking can be seen. 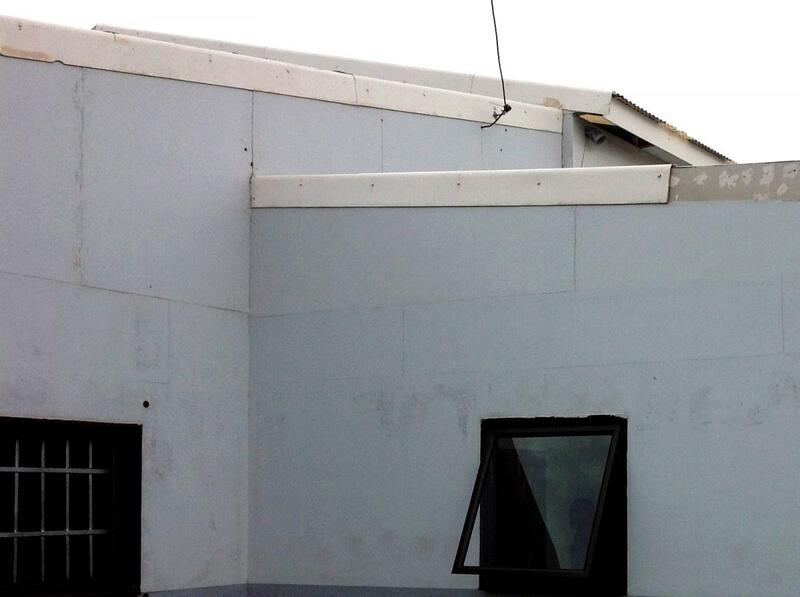 Lotus Gardens Primary School – uncontrolled cracking between ABT panel sections, windows and foundations. Extensive repairs are continually undertaken at lGoodhope Senior Secondary Schoo – Eastern Cape at a huge cost to the school. In the case of the Goodhope School shown above, it was evident that there have been extensive repairs to cracks - the scars from these repairs are being covered with ‘new’ paint. 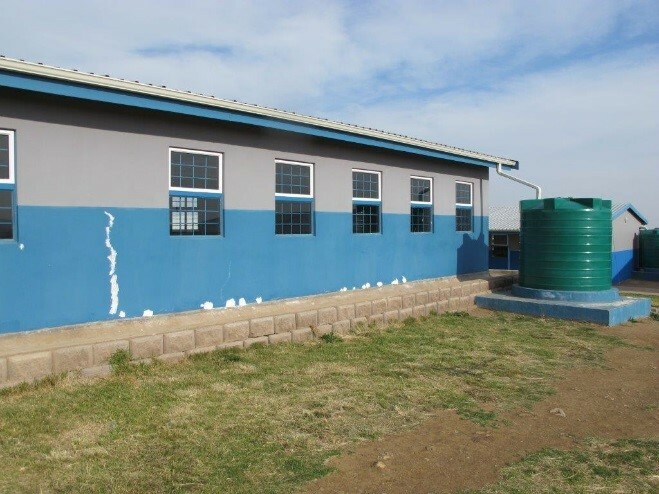 This school, since handover, has reportedly had cracks and scuffing of the exterior and interior walls repaired, and the walls repainted, no less than twice during the last three years. The visible holes, cracks and scuffing from daily use brings into question the ability of Alternative Building Technologies to provide a secure and healthy learning environment for pupils and teachers. ABT’s are manufactured by a number of different companies, and their components and use of chemical compounds during manufacture are largely unknown. They are not governed by the extensive legislation imposed on the clay brick industry regarding pollutants, health and safety or environmental protection. Schools operate during the hottest part of the day, and need to be able to regulate both heat and humidity close to the preferred human comfort zone in the hottest months. They need to provide protection against the elements during wet weather at the coast or Highveld thunder storms. They must offer insulation in the cold winter months. This is important as no school can afford heaters and air-conditioners in its classrooms. Unlike clay brick walls, the insulated lightweight walls in the schools under investigation proved unable to self-regulate temperature - the experience of heat on the inside coincided with the hottest parts of the day outside. The insulation (lacking the thermal mass of clay brick walls) trapped the heat inside making for an uncomfortable and inefficient learning environment for most of the school day. Even when ventilated and insulated, the lightweight ABTs result in a ‘hotbox’ indoor environment. This is in stark contrast to clay brick schools where the thermal mass of clay bricks provide for cooler and more comfortable day-time classroom conditions conducive to better teaching and learning. In addition to structural integrity issues and poor thermal comfort, there was a noticeable transfer of noise from the outside to the inside and between classrooms. The lack of density of ABT panels means they allow the transmission of airborne sound waves. Due to these acoustic properties, pupils and teachers are subjected to excessive noise from adjoining buildings or classrooms, which then echoes and reverberates around the large, open structures. Why do these products that have Agrement certification perform so far below below specification and expectations? 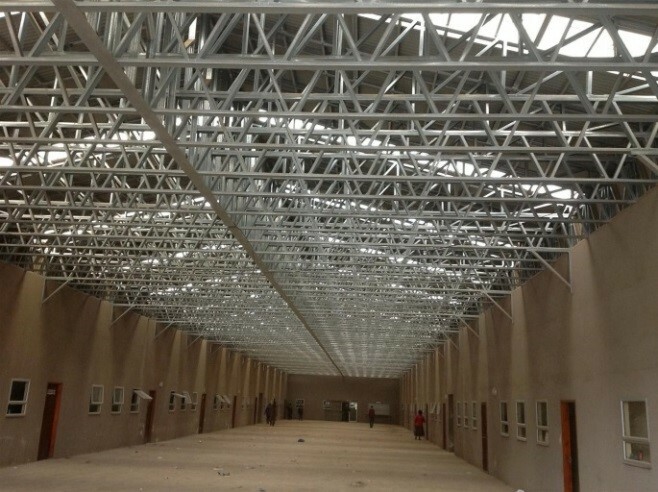 Agrément South Africa is a national centre for the assessment and certification of non-standardised construction products, systems, materials, components and processes, which are not fully covered by SABS standards or codes of practice. These products need to be re-evaluated under real world conditions rather than computerised simulations in a laboratory or test structures built in perfect conditions that have never been used. Investigations of built schools demonstrate that even after just 3 years of use, ABTs do not deliver the promised benefits of high quality structures comparable to traditional clay brick and cement structures. Even the supposed fast erection time is in doubt since only 12 of the planned 300 schools could be built during the time allocated. Complications with foundations and delivery on rural roads were cited amongst the reasons. Prefabricated accommodation designed in India, manufactured in Gauteng and placed on site in a finished state by a small group of outside installers, is the very antithesis of Governments economic policy objective to broaden the economic empowerment opportunity of communities where infrastructure building takes place. In terms of job creation 20,000 people are directly employed in brickmaking in South Africa through formal and informal brick makers. Currently 3.5 billion bricks are manufactured and sold per annum with more than 220,000 workers employed across the building industry (brick makers, brick layers and plasterers and resellers). Initial results indicate that more than one million people benefit from clay brick manufacture, making this industry a major socio-economic contributor in the building sector. Due to the low capital cost requirements, the barriers of entry by entrepreneurs to the building industry are low. This together with the wide use of masonry materials in both urban and rural areas of South Africa has resulted in more entrepreneurs being involved in brick and block laying than any of the alternative wall construction types. Alternative building technologies that cannot be made, installed or even repaired by local contractors will have a severe detrimental effect on both local job creation as well as the transfer of construction skills to local residents. Based on the incontrovertible evidence of the 10 schools reviewed under real world conditions, the ABT schools are a distinct and clear compromise. The clay brick schools provided safe and secure, unquestionably superior quality built environments for teachers to teach and scholars to learn, study and play. What is the REAL cost to the taxpayer of the government’s new enthusiasm for factory-built modular building technologies for schools, clinics and low cost housing? It would be sensible for decision-makers responsible advocating ABTs over clay brick construction for schools infrastructure to take the time to see the schools that have already been been built, and compare for themselves. The sole objective of a school is to provide a safe, comfortable and secure learning over decades. Teachers and communities alike question if ABT systems can begin to meet these critical requirements. Luleka Mhlontlo, Deputy Principal, Umtata Community School. “This school was built in 1980. As you can see we are close to the police college so the first learners wre from those of the police. The old school is from blocks . “Last year in April because we have got 1 413 learners we went to the department seeking additional classrooms but we got the pre-fabs instead. At least it has alleviated the problem of overcrowding, but when it is cold, it’s COLD. When it is hot, it’s VERY hot. Yes we do buy fans but all all classrooms have not fans. Yes, it really affects the learners. They get drowsy. When the learners are in the classroom… you can feel that there is this big noise.